June 17, 2018 8:02 p.m. I'm finding that the Font node often creates poor splines for certain letters. 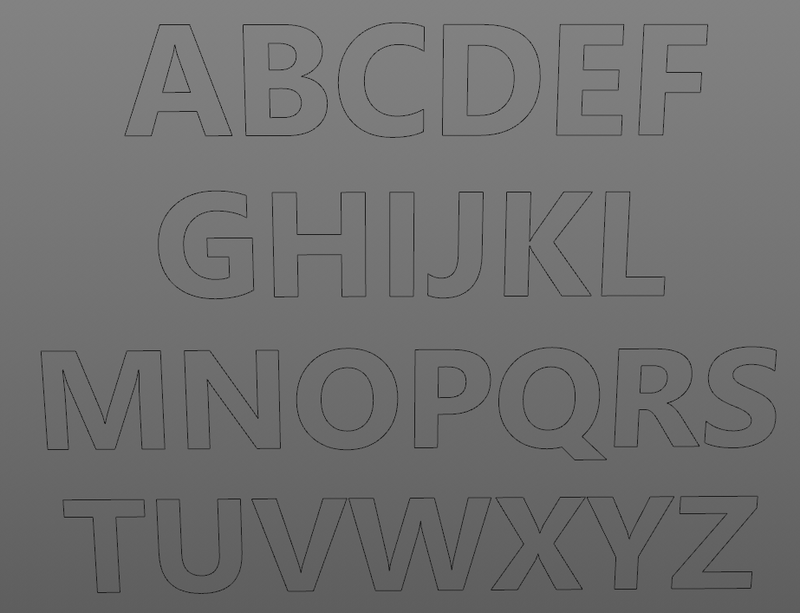 For instance, look at the letters A,B,D,O,P,Q, and R in the image below, and see how the spline crosses the letter geometry, making it difficult to use the splines for extrudes, bevels, text edges, and the like. Any thoughts on how to get the native Houdini splines to look more like the native Cinema splines? June 18, 2018 11:46 a.m.
Houdini doesn't handle fonts very well. In your example above, Houdini is creating ngons without holes. The problem is it doesn't do it well at times, as shown in your letter “R”. As was pointed out on another forum, it can fall apart for double holes, as in the capital “B”. 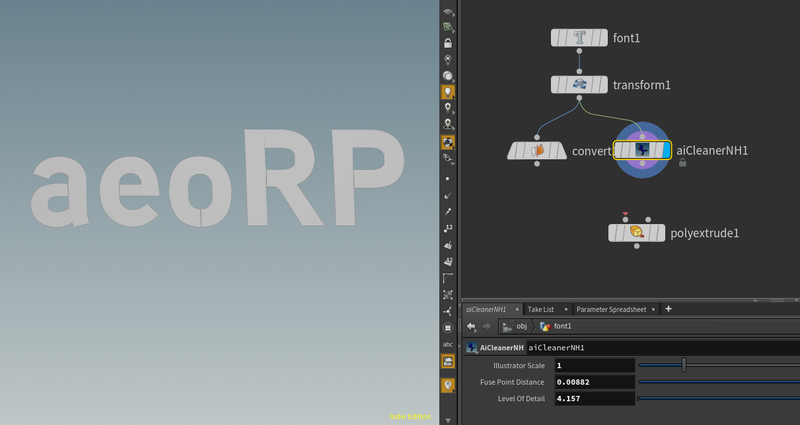 If you plan to do extrudes and bevels, I don't see any good solution in Houdini other than retopo of the fonts. 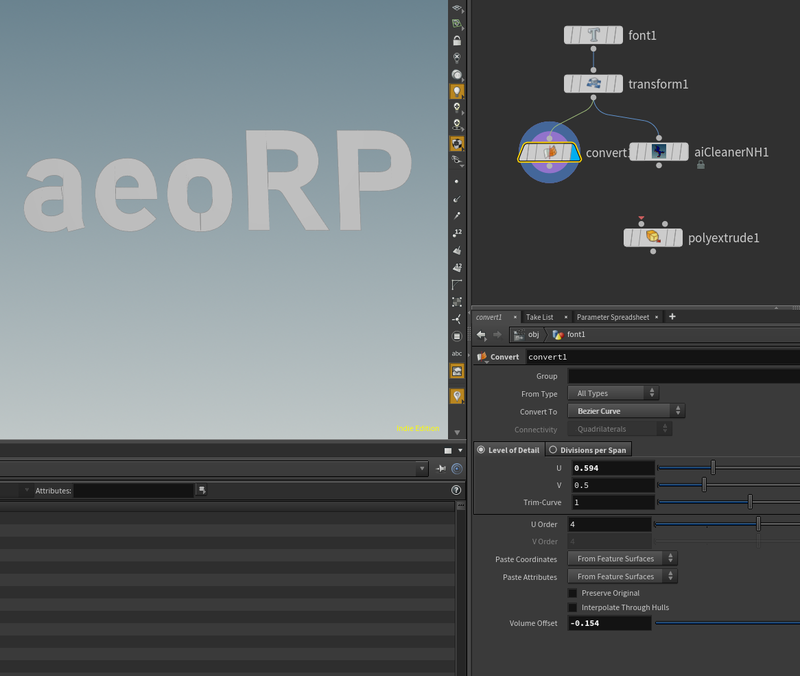 C4D falls apart as well if you plan to make the font outlines editable and add any subD at a future time. It works fine if you are doing simple extrudes and using one of the premade caps. June 18, 2018 11:49 a.m.
Good to know; wasn't sure if I was missing something obvious. Thanks! June 18, 2018 4:27 p.m.
Haven't used font sop in a while, but remember this happening before. Just played around with it. When set to polygon, must of tried 15 different fonts and couldn't find any ‘defective’ ones. Changing to bezier it does happen more often. One is to start off with the font as polygons, then plug that into a convert which will give you the font as a bezier like if you had done it with the font sop alone, this time though it comes out clean. It tends to give you more ‘control’ points because you started with a polygon - but you could insert a resample to reduce that. I've tried a few fonts with this method at different scales - it seems to work. Another option too, is that because each font is designated as a primitive. You could run the fonts through a wrangle and make changes to remove the ‘defective’ ones. Takes a bit of work, but once it's done its' only done once. You could keep it as an asset and just plug it in anytime you use the font sop without having to think about it. You could also expand that wrangle asset to accomodate different font choices. June 18, 2018 6:10 p.m. Here are defects both with bezier and polygon interpretation of the first font loaded. 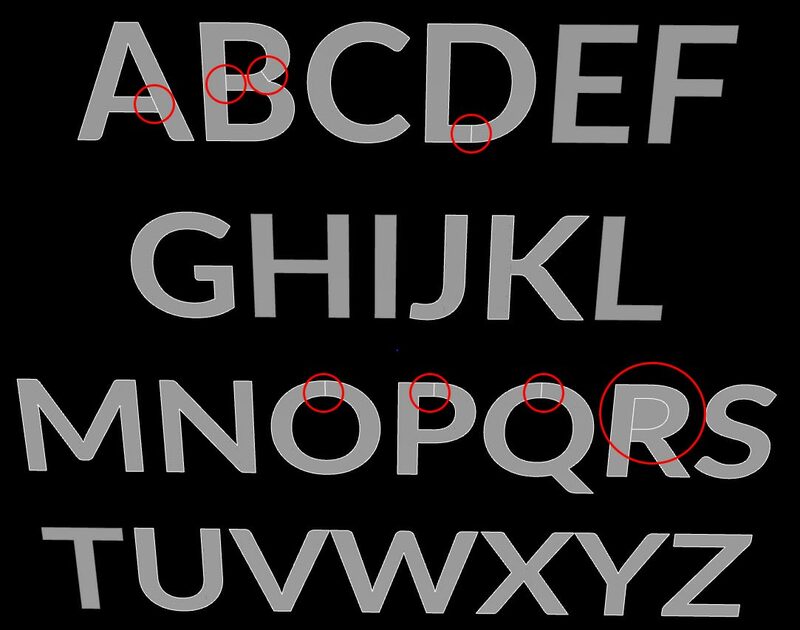 Whether the bezier or polygon interpretation work seems to be dependent on the font. I've tried several. Some work, some don't, some work for one interpretation but not the other. The same fonts work fine in C4D. June 18, 2018 6:22 p.m. Your using a very rare font. Not saying won't experience the same with even a more common font. But I can't even find that font doing a searh on the net. ( I wanted to see how it goes on my system ). But even so, you can still wrangle out the ‘defects’ if you want. June 18, 2018 9:17 p.m. It's the default font loaded up when I create a font node as well. Perhaps it's a Windows font? This is the technique I'll probably end up trying. Thanks! June 19, 2018 9:04 a.m.
June 19, 2018 9:07 a.m. I'm on Windows 10 here. It's also part of Adobe Typekit, so that may be another potential source. June 19, 2018 10:42 a.m.
Ive used this hda a while back to clean up font sop output and ai files. There are some node comboes inside the hda that you might find useful. June 19, 2018 11:28 a.m.
Hmmm, the convert to Bezier option doesn't seem to be working as expected, and I'm not finding much success with the aiCleaner. Not sure if I'm doing something incorrectly? June 19, 2018 10:10 p.m.
Those actually look quite clean, unlike my examples above where “p” and “b” are messed up in the bezier interpolation and “B” in the polygon one. In your example, connect the aiCleaner to the polyextrude and see how it looks. Don't try to export your extruded AI or text file as fbx or obj in Houdini (it creates a total mess). C4D must allow ngons with holes, but Houdini doesn't as far as I can tell, so you will always have those edge cuts on letters with central holes. I don't know if you right clicked the aiCleanerNH1 and looked at the nodes. Basically it adds a “hole” SOP, adds a “fuse” to correct very close points, and selects polygons with normals faced the wrong way and fixes (reverses) them. Cinema 4D does illustrator and text extrudes much better but be aware that if you make these editable in C4D, you will have a lot of work to do (retopo or lots of edge cuts) to make it a proper 3D object with quad topology. Here is a Houdini file that uses an Illustrator input to create a typical logo. June 27, 2018 3:55 p.m.
C4D must allow ngons with holes, but Houdini doesn't as far as I can tell, so you will always have those edge cuts on letters with central holes. Sorry for the super late reply! ^Your quote there explains the situation best; this limitation of Houdini made some effects complicated in the past, such as using the text spline as a sweep for a custom shaped bevel, placing seamless textures on the face of extruded text, or for using the “o” spline as a profile spline in a sweep to create pipes/tubes with thickness. Those are all doable in C4D, but there are small gotchas like these hidden in the H workflow. What I'll probably do is simply create my text splines in C4D & send them over to H as alembics.